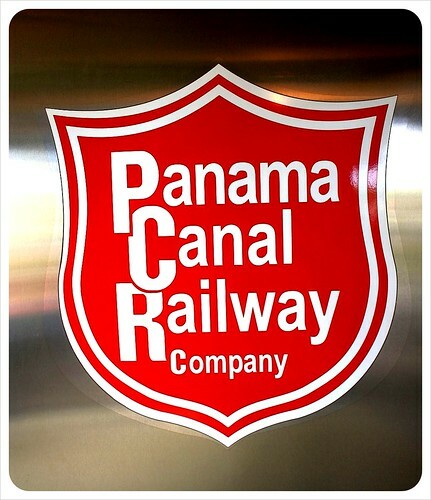 We had heard about the train ride along the Panama Canal months before arriving in Panama City, and there was no question we were going to do it. In fact, we had really been looking forward to it. 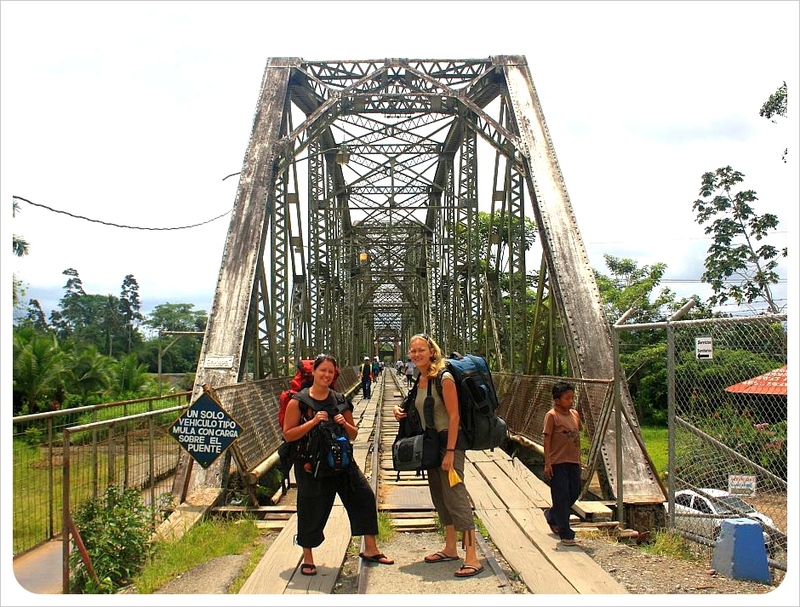 I have been fascinated with the Panama Canal for years, and we both love train rides – an activity nearly non-existent anywhere else in Central America. The idea of connecting those two for a great day out was a no-brainer, with thoughts of speeding through the dense jungle which connects the Pacific and Caribbean coast, spotting exotic animals and fascinating flora, learning more about the canal and spotting the mega-container ships as they are lowered and lifted at locks along the canal. Unfortunately, the train ride didn’t quite live up to our imagination. Described as a luxurious train ride by two different guide books, we were so tempted by the experience, even in spite of the early morning departure time. The train leaves from Panama City at 7:15am and arrives in Colon on the opposite coast 45 minutes later, returning to Panama City at 5pm. In reality, calling this trip luxurious was a stretch. 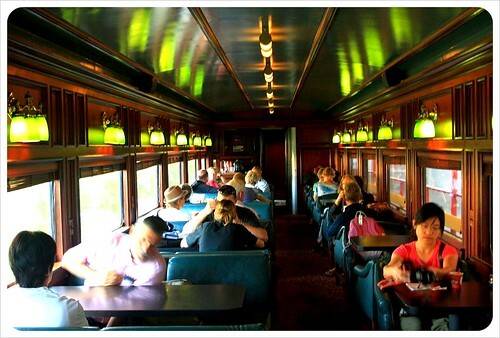 Sure, the train car’s design harks back to the glory days of train travel, with carpeted floors, soft, low lighting and strong wooden paneling throughout the car. Waitresses served us each a very tiny paper cup of instant coffee, a small plastic cup of candy yogurt and a cookie. But that was as luxury as it got. No guide explained what we were seeing, no fun period music played in the background, no typical Panamanian food/breakfast/coffee was served on board. 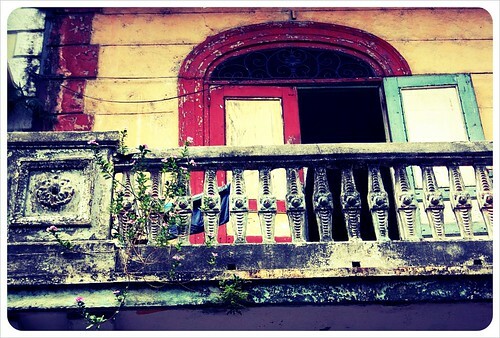 Panama City does luxury very well, and while this train ride was pleasant, it was by no means luxe. Only one train runs along these rails each morning and evening, and as such, this is not only a tourist train but also functions a commuter train. The 7:15 departure time is geared much more toward professionals than any sort of comfortable time for tourists. 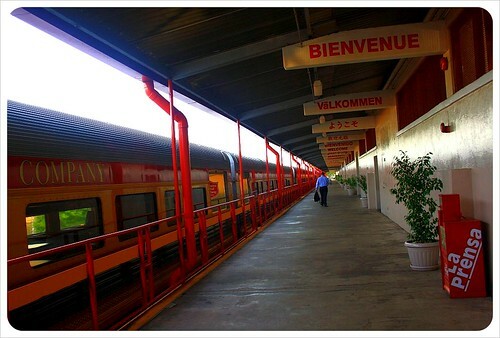 On arrival to the station, foreigners are led to a specific car of the train, and locals, who most definitely do not pay the $44 return fare, are seated in the five to six additional cars with the same views, minus the free coffee. Back in the tourist wagon, we were lucky enough to snap up the last seats with canal views, and those who came after us were seated on the other side of the car. Plenty of people went outside to the viewing platform outside and took pictures, but the views were okay at best. Where was the wildlife everyone was talking about? The train cuts through green jungle for most of the way, but we saw much more wildlife in the Metropolitan Park ($2 entry fee) right in the heart of Panama City. 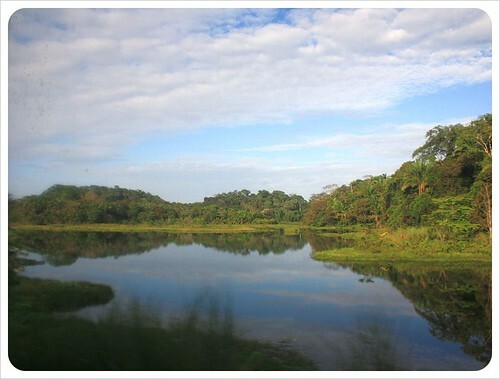 The canal itself was only visible in parts and we spotted water through breaks in the flora until reaching Gatun Lake. This is widest part of the canal as well as the most beautiful, yet as quickly as the lake came into view, it disappeared again, very similar to the feeling of the canal ride in general. 55 minutes sped by so quickly it felt like as soon as it had really begun, it was over and we had arrived in Colon. 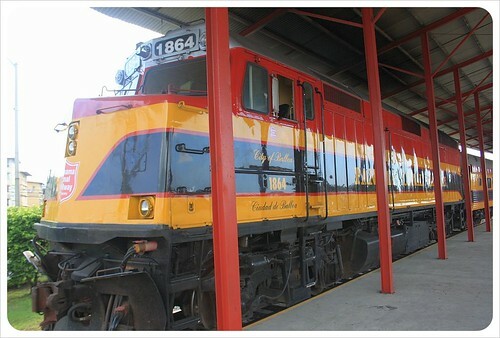 Before getting off the train – and not a minute before – every passenger was given a ‘Panama Canal Train Ride’ snack box with a mini-can of Pringles and small packs of cookies, peanuts and raisins. Despite its childish Happy Meal feeling, the main issue we had with this was wondering why on Earth these snack packs would not have been handed during the ride? Many of us had not had any breakfast and the station had no food at all, so most of us were already ravenous. 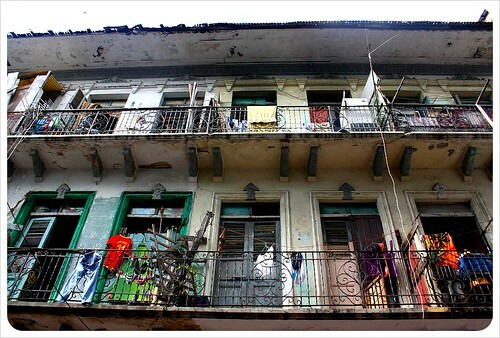 The train ride does not even extend to the third and final set of locks, but rather right in the center of the city – known by all as one of the most dangerous cities in Panama. 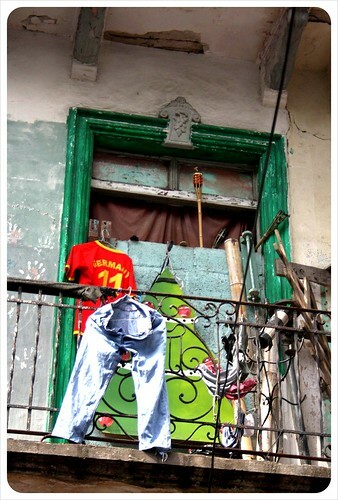 Locals had warned us not to visit Colon at all, but what to do for those nine hours before the train returns at 5pm? Upon exiting the train, it was expected that the tourists allow themselves to be corralled once more into one of the day trips to nearby beaches (for $100) or overpriced trips to the nearby Gatun Locks ($60 – the bus there was 25 cents) offered by taxi drivers with fancy (old, torn up) posters at the station, which every other traveler but us seemed to do. After fifteen cabs took the 40 passengers everywhere else but Colon, we were semi-stranded, alone, at a train station in a seriously shady area. We shortly found our way to the bus station and headed to the Gatun Locks. 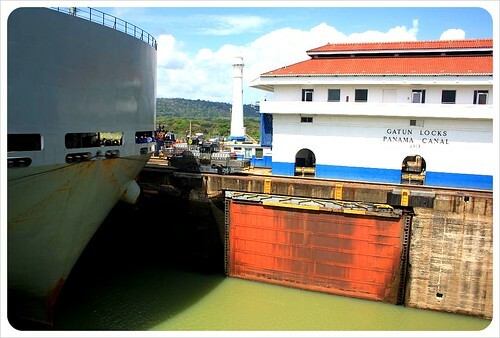 The visit was fascinating, and a more intimate affair than the Miraflores Lock in Panama City. The staff was full of information, answered questions personally, and visitors were few and far between in comparison. However, after an hour, with no museum, no café, no visitors center, we weren’t sure how to spend the next several hours before the train returned. We opted instead to return to Panama City by bus, which, at a fraction of the fare was just as fast and brought us directly to Albrook Mall in the city, rather than the train station which is a cab ride from anywhere. Would we recommend the train ride? 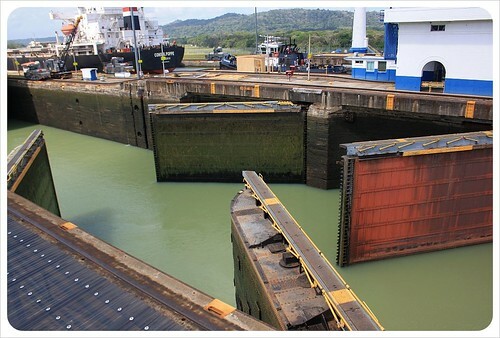 If you only want to have seen the Panama Canal, visit the Miraflores locks from Panama City. 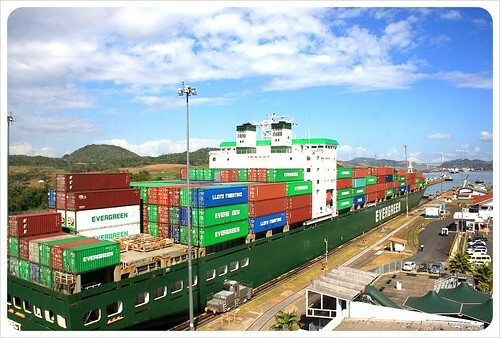 For all other travelers who are truly interested in the Canal, we would recommend a visit to the Gatun Locks for a glimpse of the massive container ships head into the Caribbean or into the Canal to head out to the Pacific. Take the bus. It’s $1.50 instead of $22 per person. 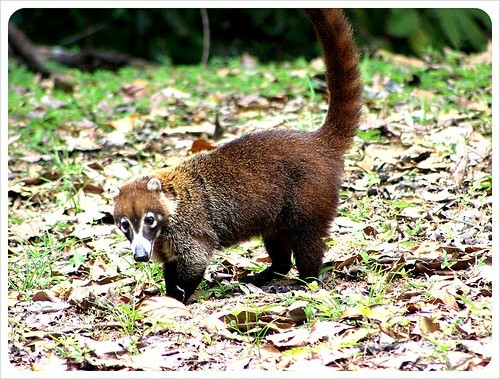 If you are looking to spot wildlife, go to Parque Metropolitano or Metropolitan Park, a jungle right inside Panama City. For day trips to the beaches, rent a car. Four people pay $88 for the train one way, and a Panama City car rental costs less and gets you to the beaches and back. 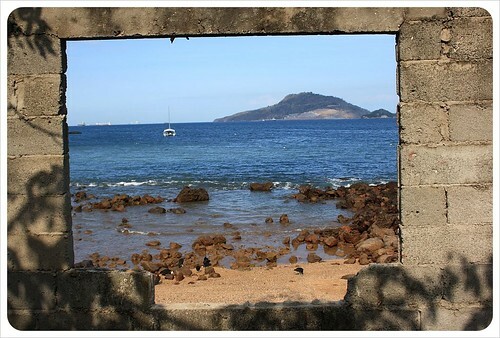 If you are looking for a quick beach escape, take the ferry out to Taboga Island instead. From here you can see the container ships lined up to pass through the canal, all while sipping on a cold beer from the comfort of the sandy beach. The Canal is the pulse of Panama and what makes the city tick, feeding it with a steady (and tremendous) source of income and international respect and fame. 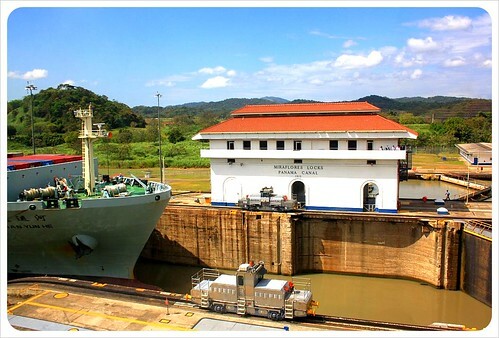 The canal cuts 51 miles east to west through the country, the impressive Miraflores locks are the first set of locks closest to Panama City, and are by far the most visitor-friendly, with a large visitor center, a museum detailing the canal’s history and a small cinema which shows a short film about the construction of the canal. Once outside, there are several terraces to view the colossal container ships being raised or lowered through the locks. 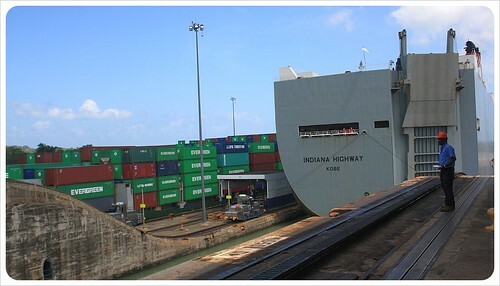 Ships carrying over 4,400 containers squeeze through the canal, paying per pound upwards of $400,000 each time to pass. In the mornings, ships heading from the Pacific to the Atlantic go through, the direction is then reversed in the afternoons. There are excellent explanations in English and Spanish over the speakers while the ships pass through, and you leave feeling very informed about how the Panama Canal (and international shipping) works. The locks are an easy 10-minute taxi ride outside of town. There is also a bus, leaving from Albrook Bus Terminal, which drops you off at the street leading to the docks (about 100m walk). The Metropolitan Park is so much more than just a park. It’s an entire rainforest in the city, home to hundreds of animals and an oasis of peace and quiet in an otherwise very busy city. 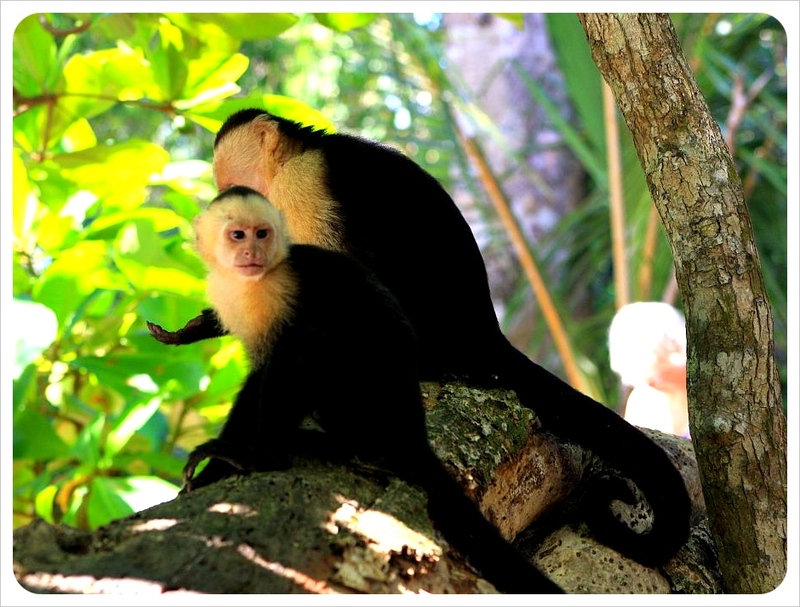 On a hike you can spot monkeys, anteaters, pacas, toucans, woodpeckers, hummingbirds, turtles, ‘jesus christ’ lizards, butterflies, snakes and many more. 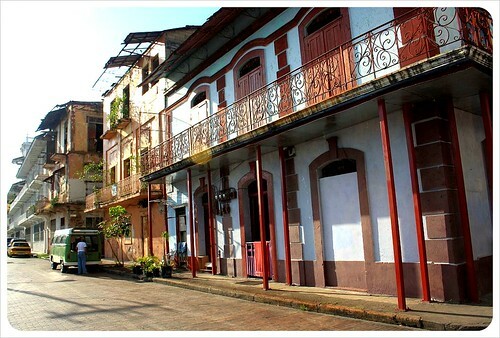 Casco Viejo is may be Panama City’s historic heart, and was declared a UNESCO World Heritage site in 1998. 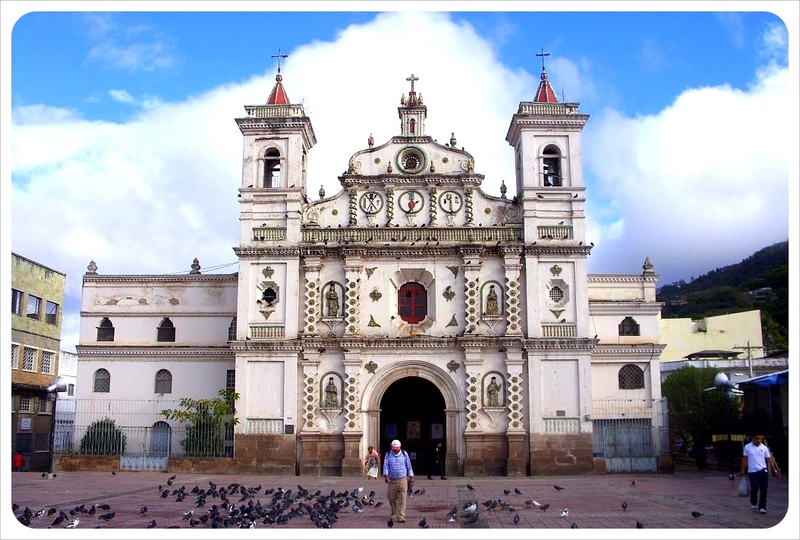 Many of the colonial buildings lining cobblestone alleys and grand-tree filled plazas for this reason have been restored, and the colonial churches and architecture make this part of Panama City feel more like Europe than anywhere else in Central America. 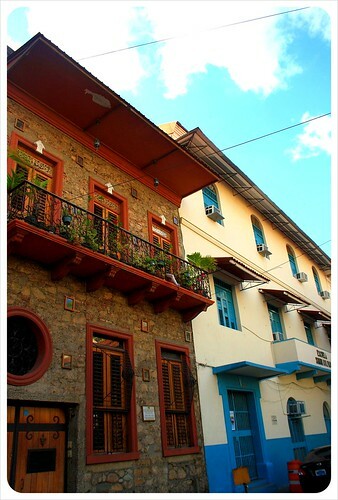 Take time to stroll through this beautiful quarter, which was even featured in the James Bond film ‘Quantum of Solace’. 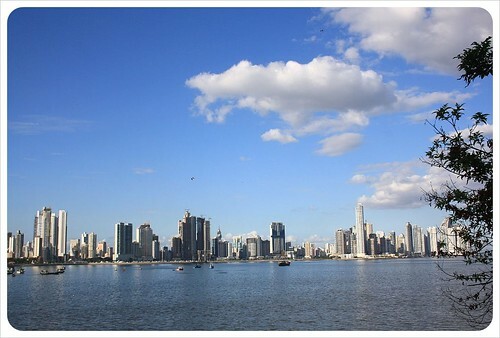 Although the true center of the city with time has shifted to the financial district 2 miles up the waterfront, Casco Viejo, has several excellent restaurants and cafes, cheap eats, and easily the best views of the stunning Panama City skyline. 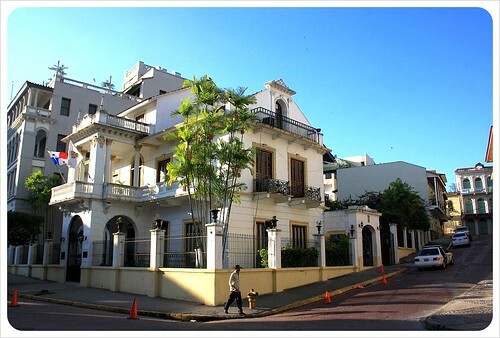 Starting in Casco Viejo and ending at the Multicentro Shopping Center in the Bella Vista area of the city, there is a two-mile long promenade along the waterfront which is perfect for enjoying the skyscraper skyline set on the Pacific Ocean. 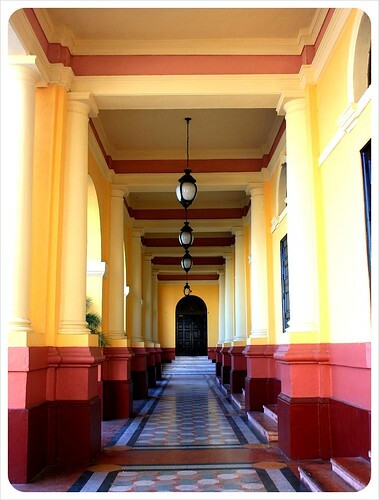 You will walk toward this impressive architecture passing the famous fish market, the yacht harbor and dozens of freights ships lined up and waiting to pass through the Panama Canal. The promenade is well-paved and easy on the knees, and hundreds of joggers weave around you as you walk. 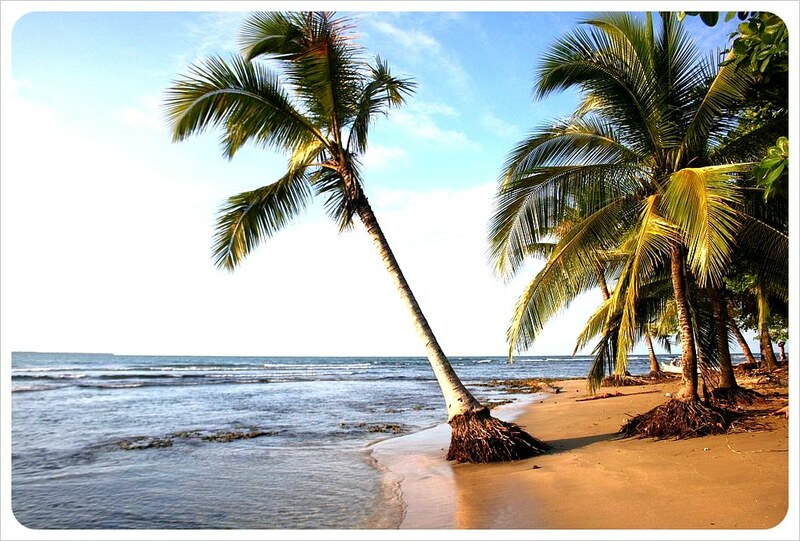 If you’re looking for a place to stay fit in Panama City, jogging here is perfect, just make sure to get up early, as the heat in the afternoon can be oppressive at best. Panama City can get hot, extremely hot! 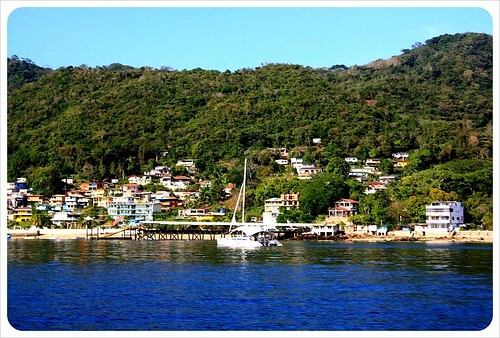 If you have a few days in the city, Taboga Island makes for the perfect day trip. 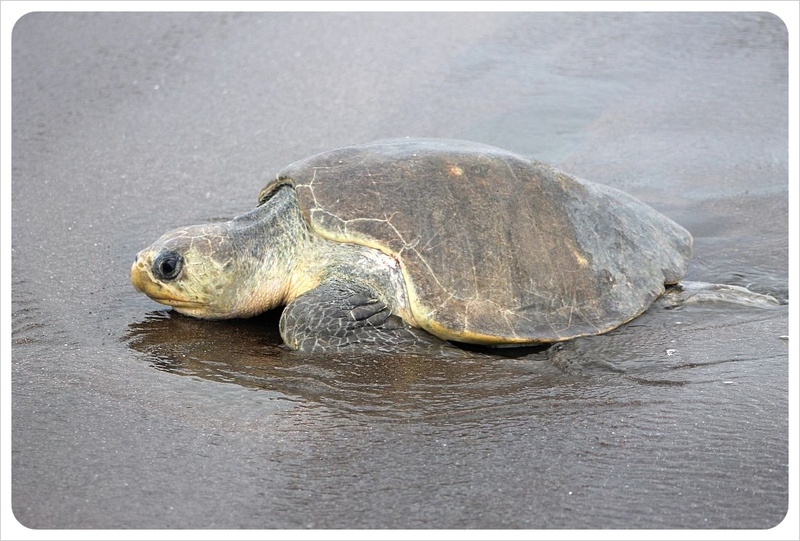 12 miles off the coast, this little island does not have much more to offer than a small sandy beach and crystal clear water, but that’s all we needed to escape the bustle of the city just a 30-minute ferry ride away. 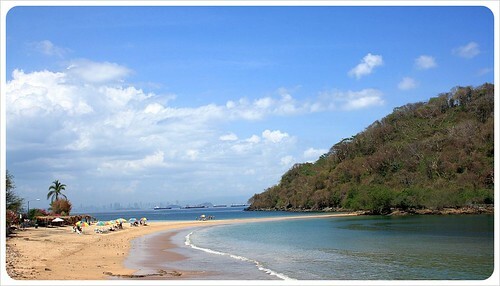 If you get bored lying at the beach, this tiny island paradise also have hiking trails and the small village center has a couple of cheapish restaurants with excellent seafood and ice cold beer. 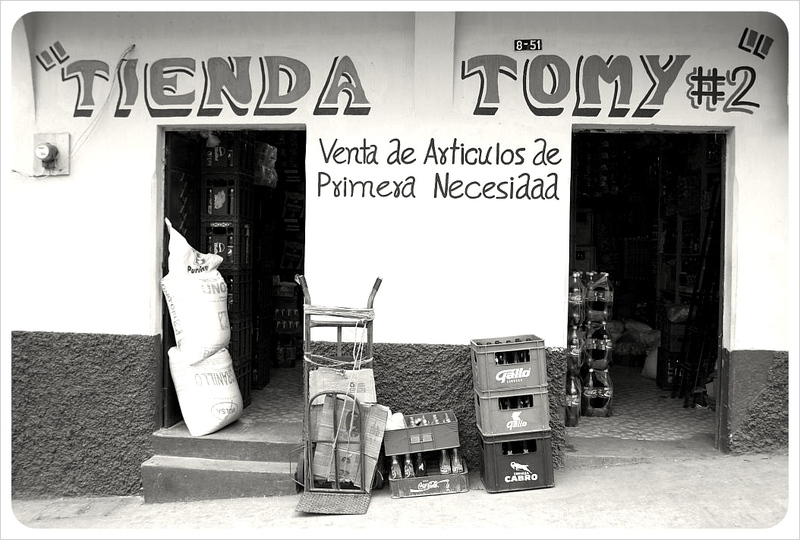 See a movie in English & go shopping! 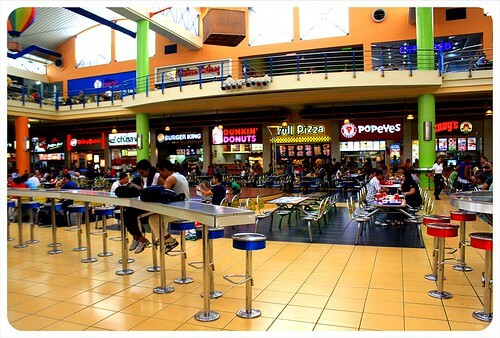 We know that for backpackers, a shopping mall is not high up on the list, but if you have been on the road for a while, a visit to one of Panama City’s malls is like being teleported home. 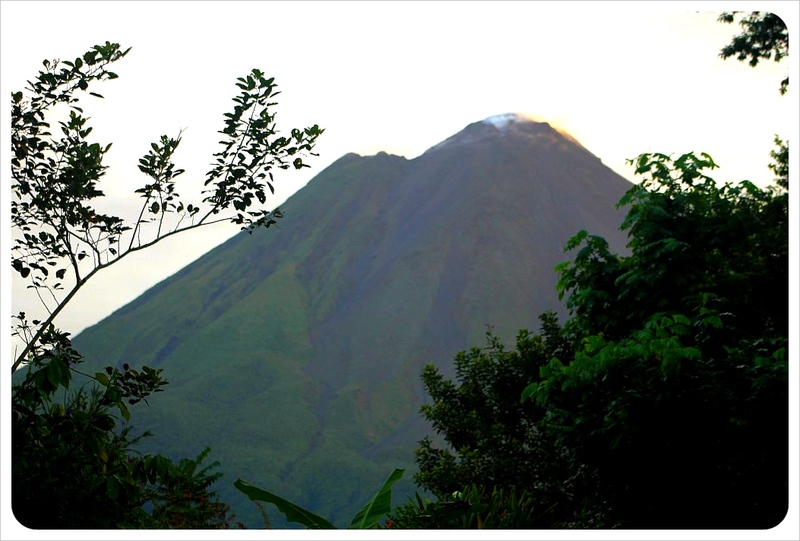 We had been travelling for over six months through Central America and welcomed the chance to sit in an air-conditioned movie theater (did we mention Panama is hot?) watching current and cheap ($3) Hollywood blockbusters in English at the Albrook mall (also the main bus terminal). 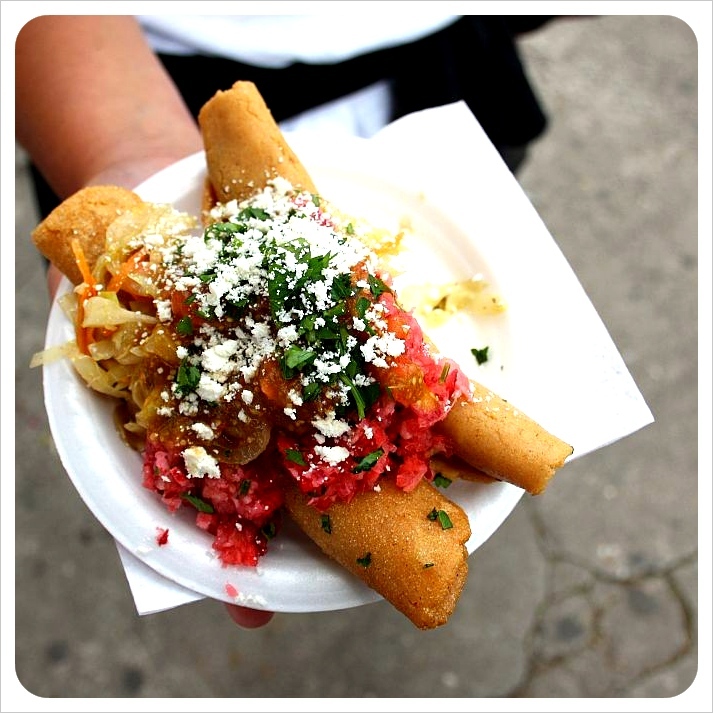 And sure, we know you don’t want American fast food, we’re backpackers, right? Well… we scarfed down Taco Bell at the huge food court which has everything you could possible crave – Subway, Mickey D’s, Taco Bell, Dunkin Donuts, Popeyes, Wendy’s … you name it! A last tip for long-term travelers: if your clothes need replacing (and not just in the form of traveler pants), the malls here are great for that. Not only do they have clothes that are more North American or European in style, they also have sizes to fit us non-Latinas out there! The rhythm of the light waves tapping at the shore made the only music on this otherwise peaceful morning. 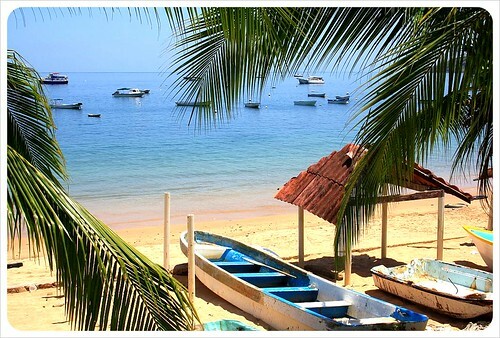 We soaked up still soft sun rays as we laid half asleep on the gentle, warm sand after arriving unusually early to the idyllic beach at Taboga Island. 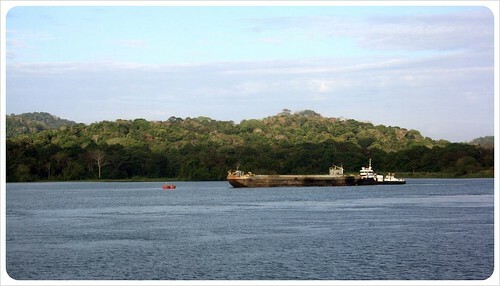 The 30 minute, 12-mile ferry ride leaves from the Balboa yacht club in Panama City at 8.30 each morning, filled mostly by locals and construction workers. 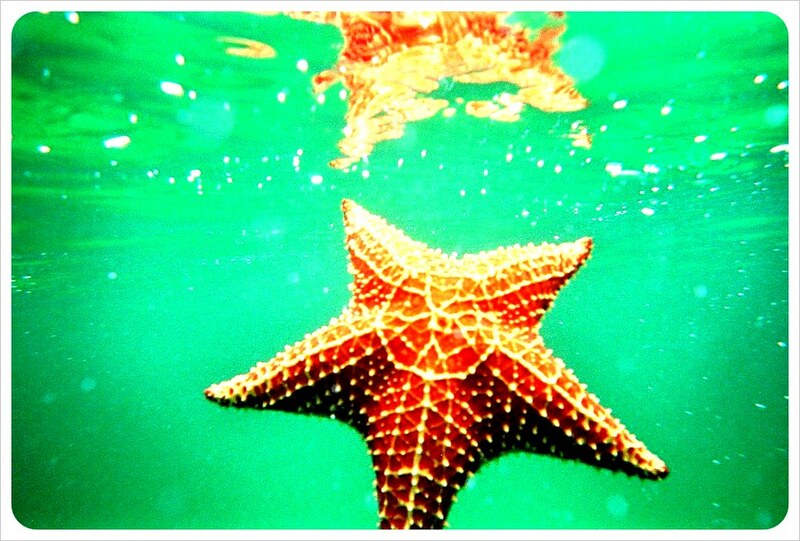 This left us as the only passengers to head straight to the beach. 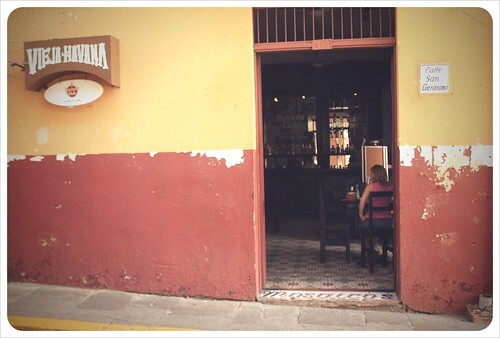 Had one of the shops or restaurants been open, we may have had coffee in one, but this tiny island in the Gulf of Panama, also known as ‘Island of Flowers’, was still fast asleep. After half an hour snoozing on an otherwise deserted beach, we opted for an early morning hike, before the sun would become too strong, forcing us into lazy beach mode. There are a few unmarked hiking trails which lead to hilly viewpoints, we were distracted by an area of hundreds of tiny, shiny green frogs frolicking in the forest. By the time we thought to continue, the sun had become too hot for a hike, forcing us back down to the beach. The stretch of sand suitable for swimmers is actually quite small, so without much left to explore, we planted ourselves right back where we had been sitting before on the sandy isthmus, and faced the other direction. By now, twenty or so others had come down to the beach from their hotels and holiday apartments, so we spent time people watching while wading in the crystal clear Pacific and watching the freighters far in the distance, lining up to cross through the Panama Canal as the solitude of the morning slowly burned off into a blazing hot afternoon. Crispy from the sun and starving from the sea breeze, we headed into town in search of shade and some grub. 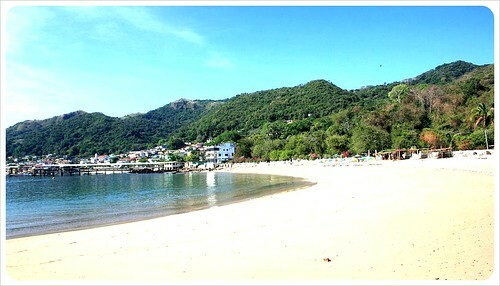 Taboga Island, population 1,600, has no cars, a few shops and a smattering of restaurants and hotels around the island. 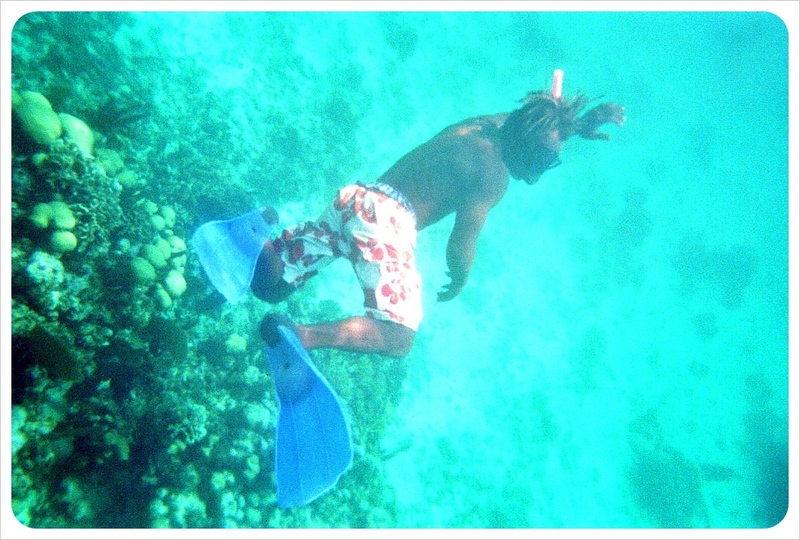 Tourism is the top source of income, with fishing a close second. It would be easy to imagine a feeling of ultimate island solitude, but between the queued-up mega freighters and the Panama City skyline in the distance, it is impossible not to remain very aware of exactly where you are in the world. After sucking down a few ice cold Balboa beers and a heaping plate of fried rice, we returned to the beach, cooling off in the water until the ferry returned to take us back to the city, eight hours after dropping us off for our perfect Panama City escape. We took the ferry from Balboa yacht club on the Amador Causeway; the return ticket was $12 per person. The ride takes around 30 minutes. 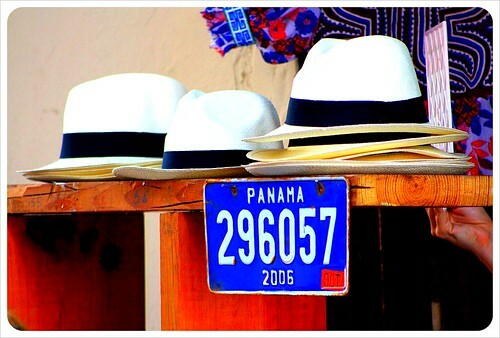 Taxis from Panama City to the yacht club are around $5 (the easiest way to get there). Check here for updated ferry times as they only leave a couple of times per day. Sunscreen, a towel and a good read. There are several cheap restaurants near the ferry dock, a cool beer is $0.75. When we arrived in Panama City, the first buildings that came into view were modern monoliths like we hadn’t seen since Mexico City eight months earlier and seven countries to the north. 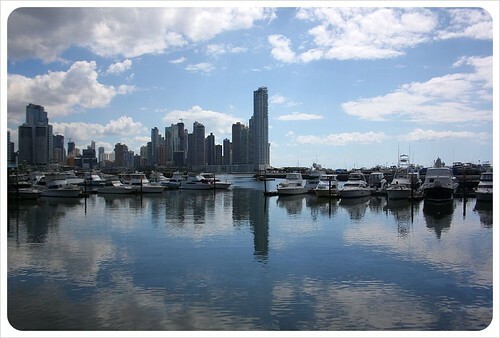 Panama’s capital has a skyline to rival most major US cities, and being located right on the water, the sight is breathtaking. 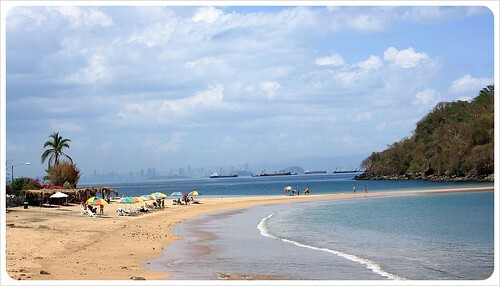 However, as contemporary as these skyscrapers and super condos are, they are the exception to the rule here in Panama. 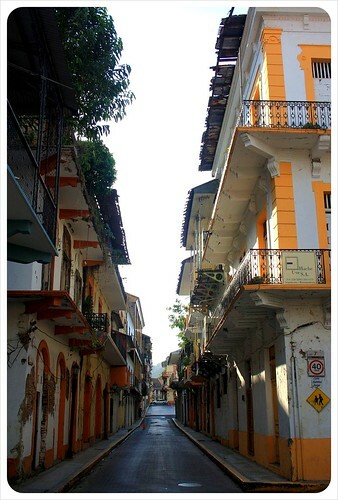 Put simply, the rest of Panama could not look more different than this area of the capital. 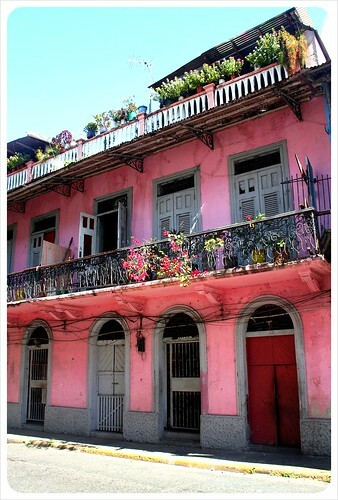 Only a few minutes away from the skyline so reminiscent of New York City, however, you enter a completely different world: Casco Viejo, Panama’s historic quarter. 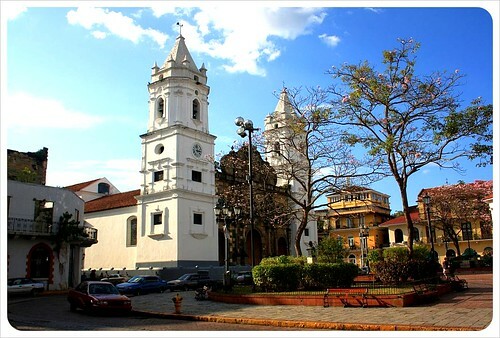 Developed in the early 16th century, Casco Viejo is the oldest neighborhood of Panama City, set on a little peninsula bordered by the ocean on three sides. 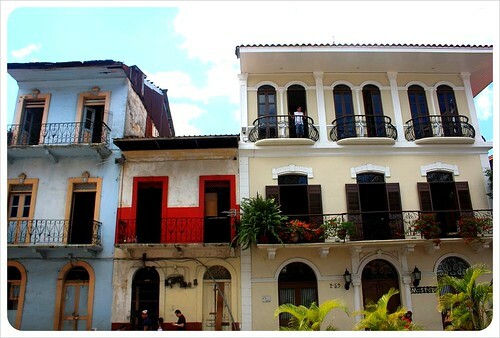 Casco Viejo is as antiquated as the skyline is modern. 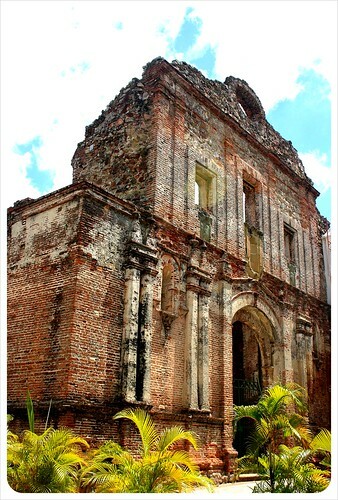 The flair that Panama City must have had in the late 19th century is still tangible when strolling between the colonial buildings and church ruins. In the well-maintained or newly renovated buildings, it is easy to imagine the bravado that must have been racing through the city’s veins, the amount of confidence Panama must have had in the late 19th century at the prospects of the prosperity to come, thanks to the construction of the Panama Canal, which would cement the city’s and country’s place on the world stage. Today, however, that mix of former greatness and crumbling buildings reminded us, although neither of us have ever been, of what Havana, Cuba must feel like. 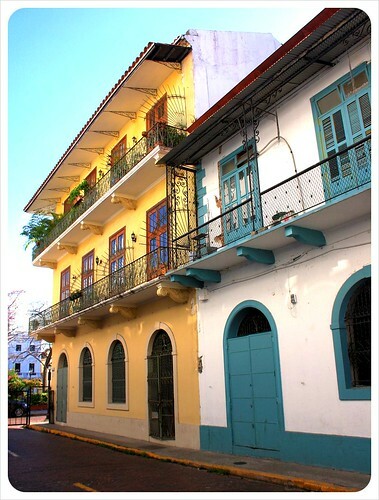 In contrast to other colonial towns in Central America, the buildings in Casco Viejo are considerably higher and have between two and four floors instead of only one. 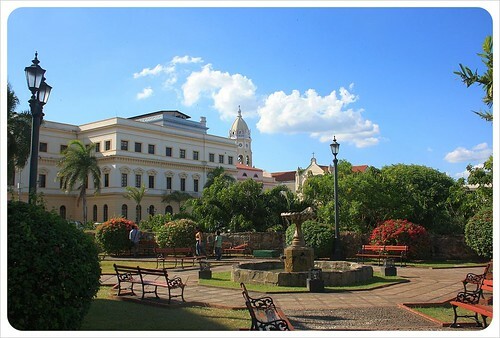 On a stroll through Casco Viejo, you will see several 15th century churches, green plazas and several grand buildings which house embassies and government bodies. 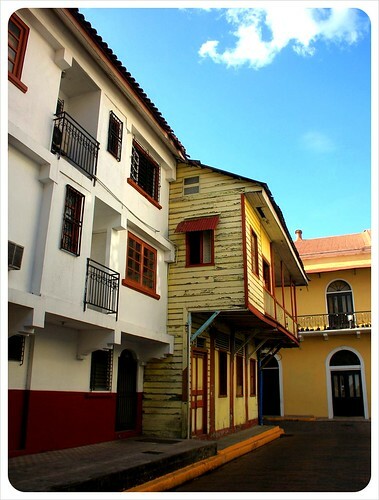 Considerable funding, both national and international, has been invested in renovating Casco Viejo, which was declared a UNESCO World Heritage Site in 1998. The area has started to flourish once more, and high-end hotels and restaurants have moved in, as well as some mid-range spots we fell in love with including Caffe Per Due, an Italian restaurant with to-die-for pizza, or Café El Vienna, a German-run coffee house. 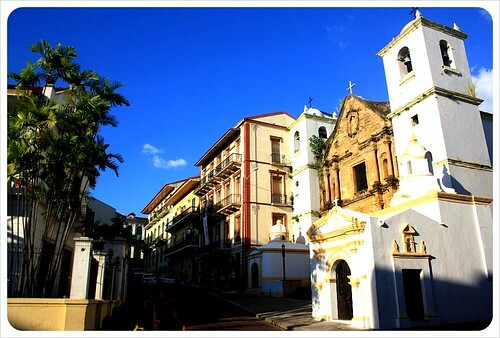 Despite World Heritage status, until just a few years ago, tourists were advised not to visit Casco Viejo. 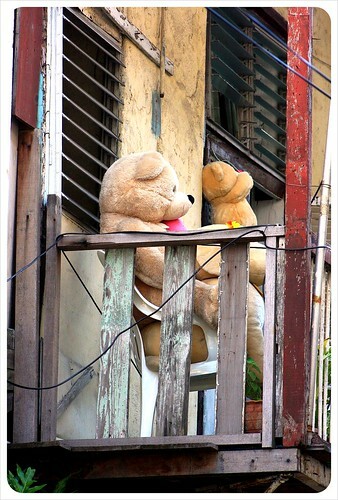 The area was dodgy, thefts and muggings occurred, and most of the buildings were run down and abandoned. In 2005, a tourism police force was put into place to reduce muggings and theft, and the number of crimes has been declining ever since. 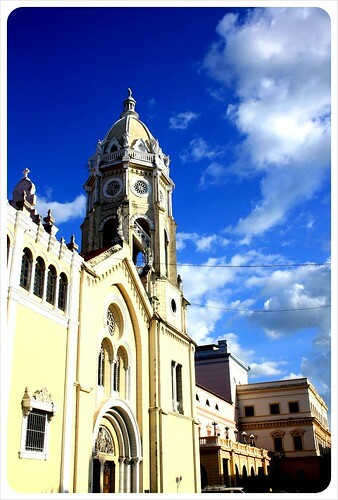 Whether it is because of the heavy police presence in the area or despite it, Casco Viejo feels very safe today. 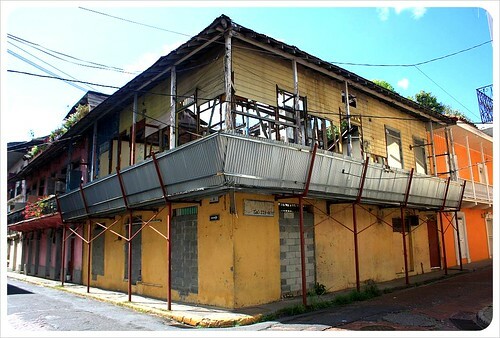 While we love exploring off the beaten path, there are some sincerely shady areas in Casco Viejo (multi-storey makeshift shanties and such) that would be better to avoid, especially at night. 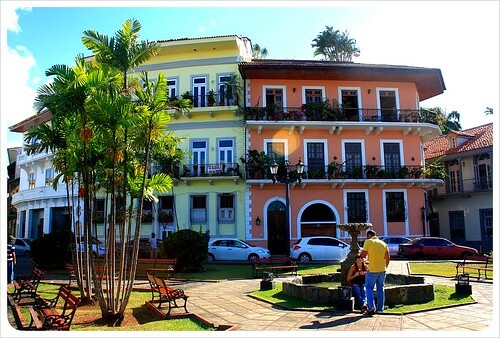 Most of Casco Viejo’s buildings have had a fresh coat of paint slapped on, several have undergone major renovation, and the area has now been converted into one of the most well-preserved colonial towns of Central America. 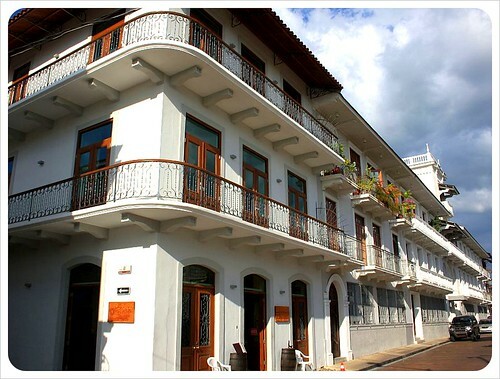 The influence of the Europeans is ever present and the high buildings, featuring the typical Spanish window shutters and grand French balconies, but the combination of renovated and run-down means you never forget that you are in Panama. 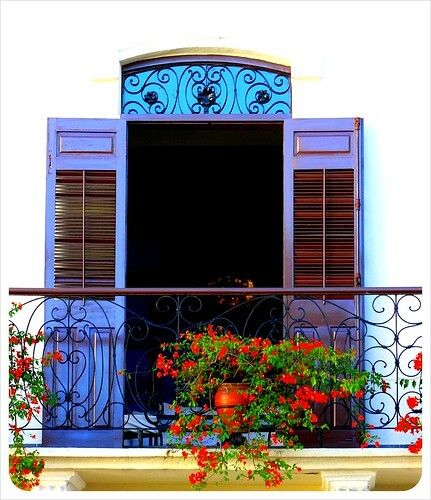 Freshly-painted iron-gated balconies feature colorful flowers, while right next door, it is the colorful laundry which catches your eye as it hangs over the old rusty balconies which seem as though they could collapse at any moment. Some buildings seem one breezy day away from falling down, but seen through the eyes of the temporary traveler, the buildings add to the neighborhood’s charm. 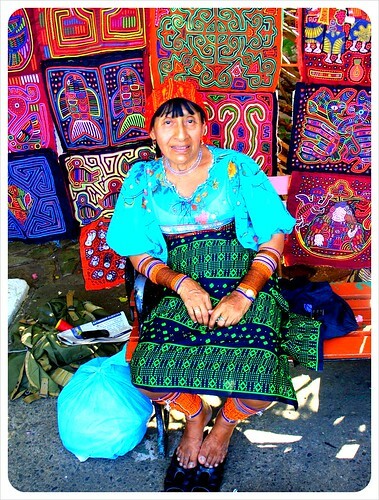 The indigenous Kuna women arrive in the early mornings, in their traditional dress, to set up their market stalls near Casco Viejo’s waterfront, where they sell their famous and unique hand-made ‘molas’ (clothes in Kuna language) and blankets in the typical bright colors. 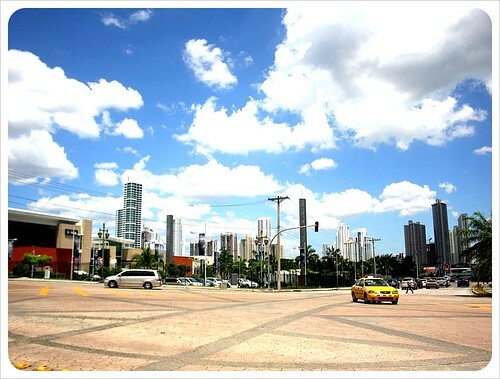 Over in the business district, where people identify more with the U.S. than with their own Panama, the Kuna presence is nearly non-existent, just one example of how the two areas of Panama City feel like two entirely different worlds. 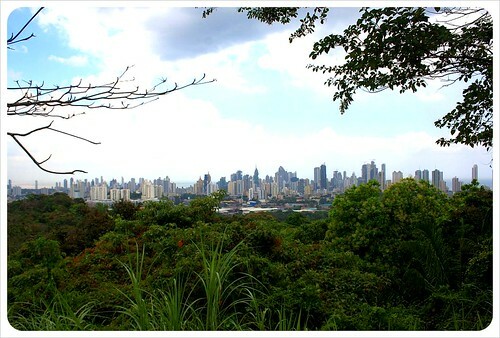 End your stroll with a walk along the promenade, which offers marvelous views of Panama City’s skyline, especially at night. 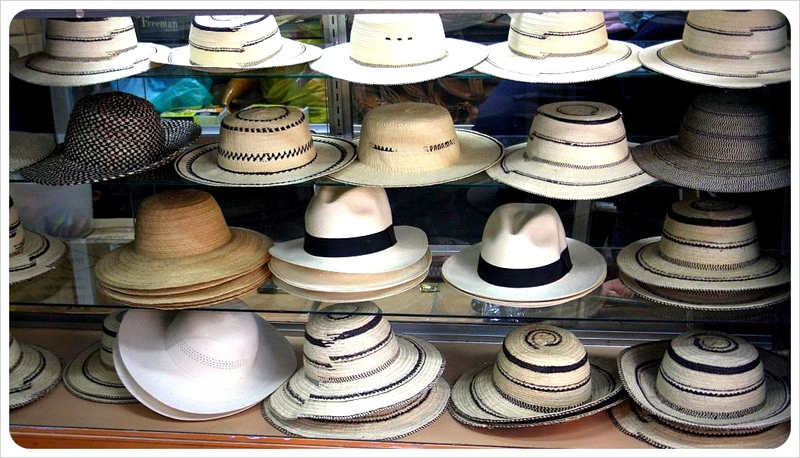 Pick up a Panama hat (you’ll never find them cheaper – surprise, surprise – than here in Panama) and other souvenirs. 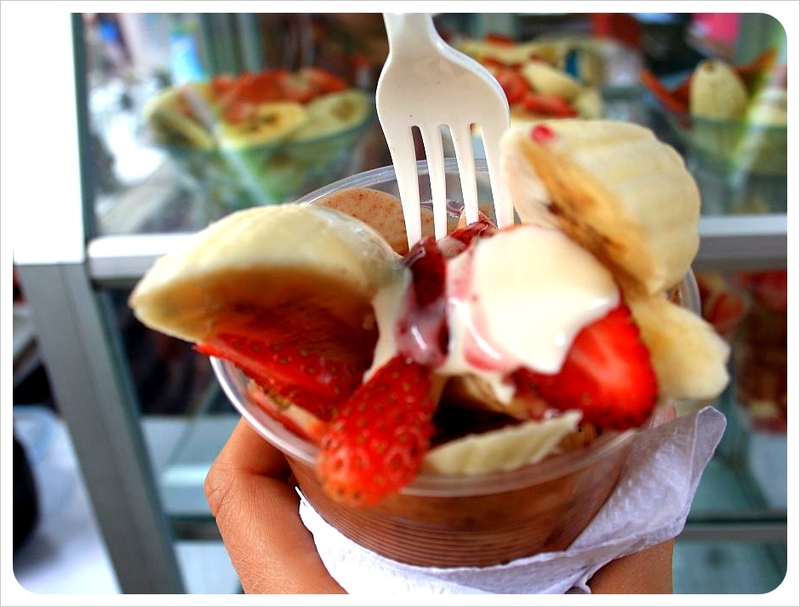 Get yourself a raspado, or shaved ice topped with fruit syrup and condensed milk, from one of the food carts and try to gobble up your ‘snow cone’ before it melts in the hot Panama sun. Welcome to our weekly Hotel Tip of The Week series. Being on the road every day of the year means we stay at countless hotels along the way. For all the dingy, disappointing budget digs, there are as many budget accommodation gems. We post one hotel tip of the week, every week, of places we feel confident recommending after having tried and tested them ourselves to show you how budget travel can be possible as well as enjoyable. 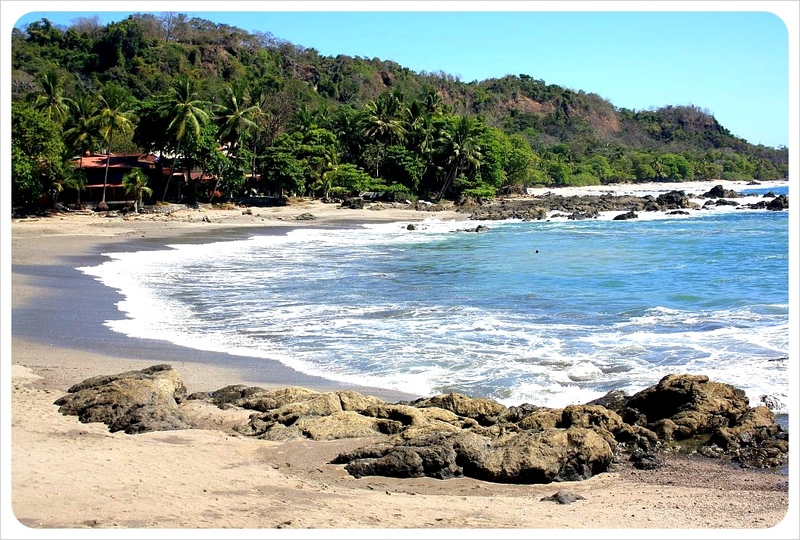 One sweltering Sunday afternoon in the landlocked town of Nicoya, Costa Rica, we stood at the bus station with hopes to get down to Montezuma, but it was late and the only direct bus driving anywhere toward the beach was headed for nearby Samara Beach. 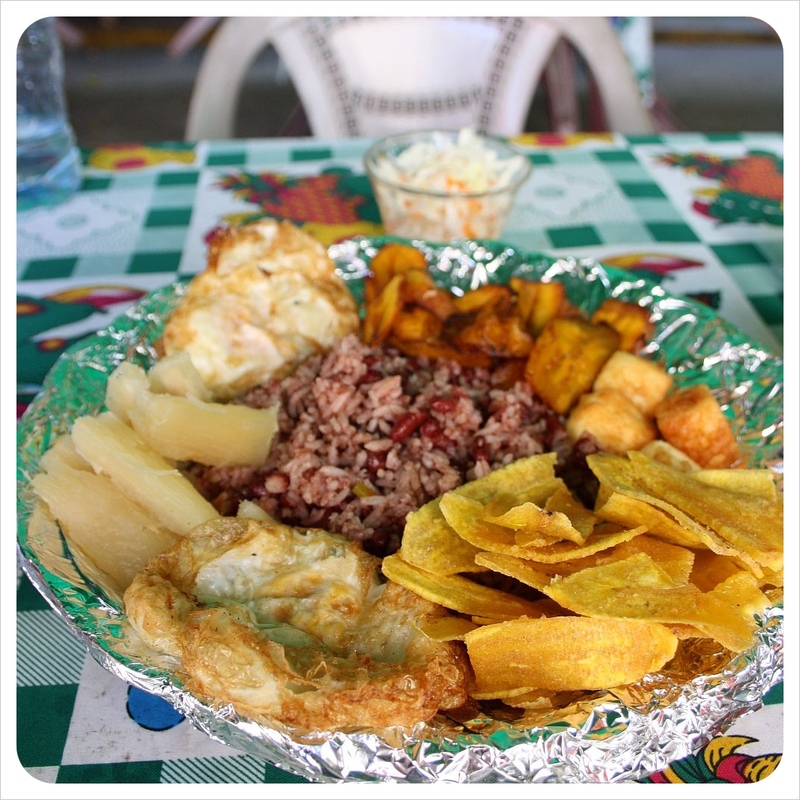 We had no idea this would become one of our favorite Central American destinations when we spontaneously hopped on and an hour later were walking up the main street, our noses sunk into our Footprint guidebook for advice on where to stay. 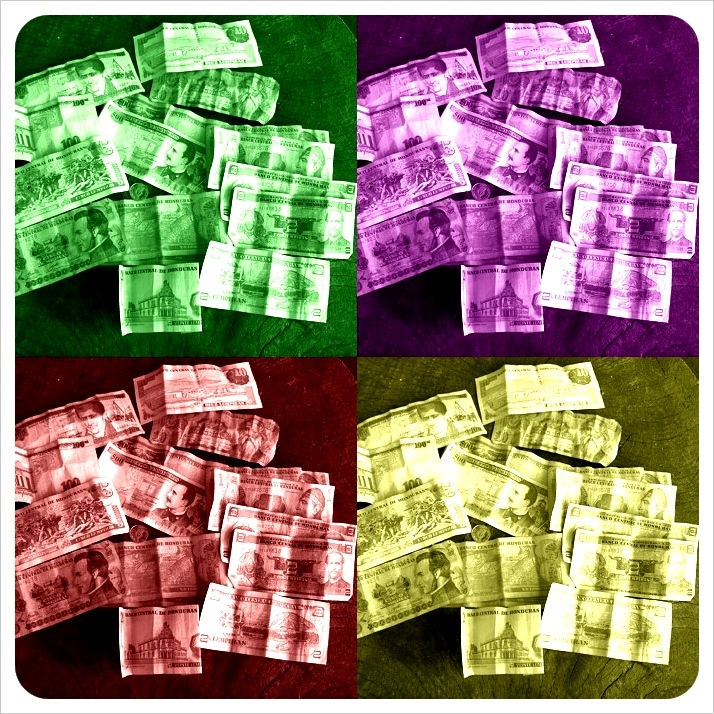 None sounded great and by looking around most seemed far above our budget. 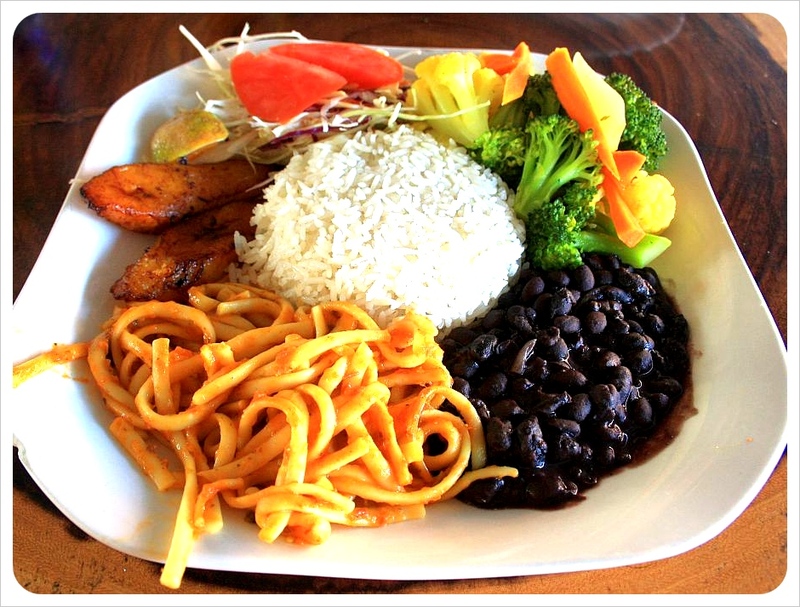 On a whim, we checked out Casa Valeria. Luck was with us that day, as it turns out, as we couldn’t have been more satisfied with our choice of accommodation in Samara Beach. 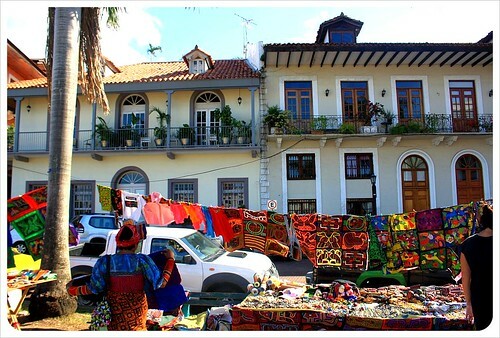 Casa Valeria sits on one of Samara’s two main streets, which runs parallel to the beach and hosts a slew of beach front hotels and restaurants. The hotel is a bit plain compared to its neighbors when seen from the street, but as we poked our head around the large entry gate, we were pleasantly surprised by the view: five stand-alone beach-side bungalows on either side of a yard with palm trees, plenty of tables and chairs, and hammocks further down towards the beach. Rather than book into a bungalow for $50, we opted for one of the two budget rooms for $30, knowing we would spend most our time out at the gorgeous beach at less than a minute walk from the door to the water. 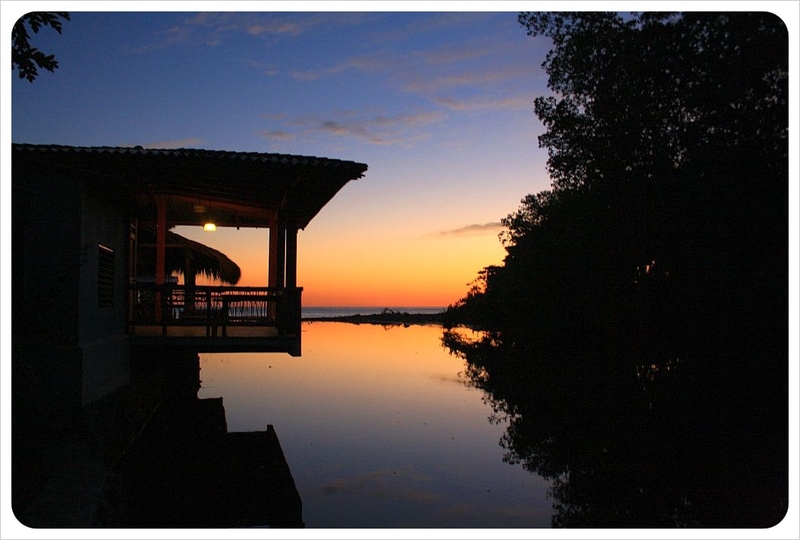 The rooms are simple, but the beds are big, clean and comfortable, the waves lull you to sleep at night quickly. 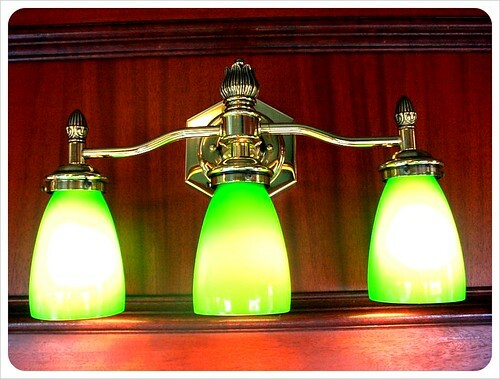 Every room has a private bathroom with a hot water, fluffy towels and creative décor. 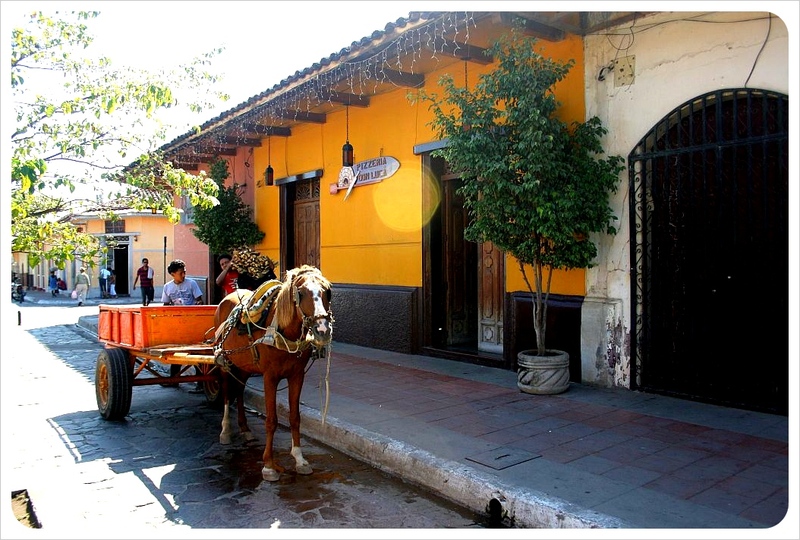 Unlike the standard hotels in the area, Casa Valeria offers a practical experience. 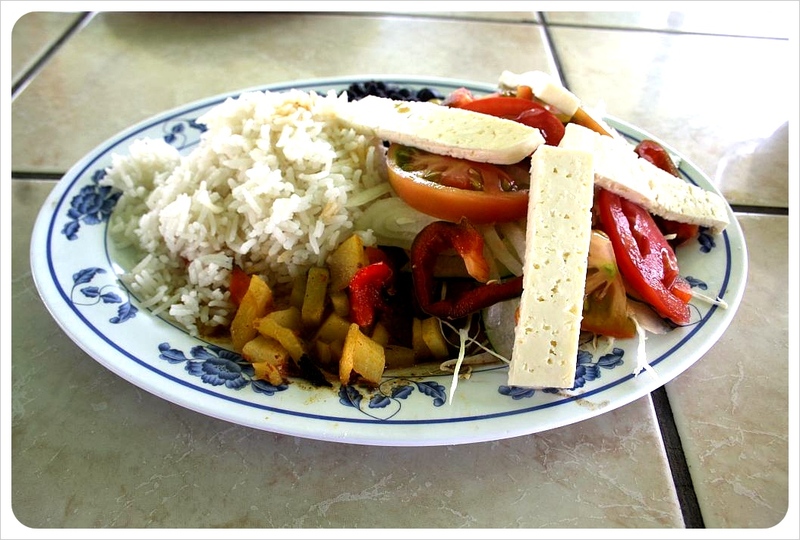 Rather than setting up an overpriced restaurant on-site, Casa Valeria makes available a large kitchen for guest use. The kitchen is clean, and while nothing fancy, has the necessary dishes, pots, pans and silverware to cook up and serve simple but complete homemade meals. Two showers are set up in the middle for washing off the sand, and plenty of clothesline space is present, outside but well-hidden, for guests to hang their wet clothes to air dry overnight, keeping your room free of that musty half-wet swimsuit smell. The beach bungalows are excellent value for money: for $50 per night, guests stay in a private bungalow that couldn’t get closer to the beach, and yet a five minute walk from a well-equipped supermarket and plenty of restaurants and bars. 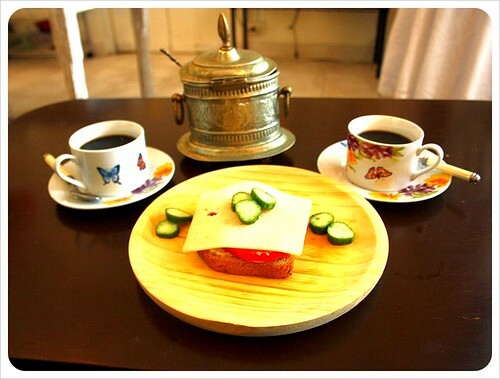 The usage of a good kitchen is one of the few advantages of hostel stays compared to hotels, and even though Casa Valeria is geared more toward mid-budget travelers, the kitchen, with its large fridge and plenty of counter space, is a great way to save cash on a at least a couple of meals and certainly on coffee. 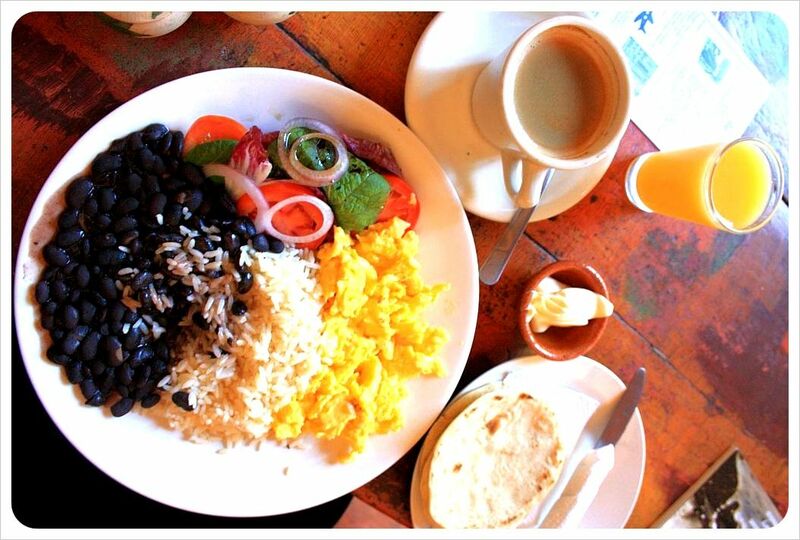 For budget travelers, Costa Rica accommodation can be pricey, so a beach front hotel with its own kitchen means a couple (or two friends) can quite easily stay here for around $40 per day per couple, food included. We almost never stay somewhere without Wi-Fi and Casa Valeria was an exception to the rule. One evening as we sat writing (and probably getting more work done without distracting gossip blogs, videos and Twitter) we overheard the son pointing us out to his mother, explaining the need to install wireless internet. 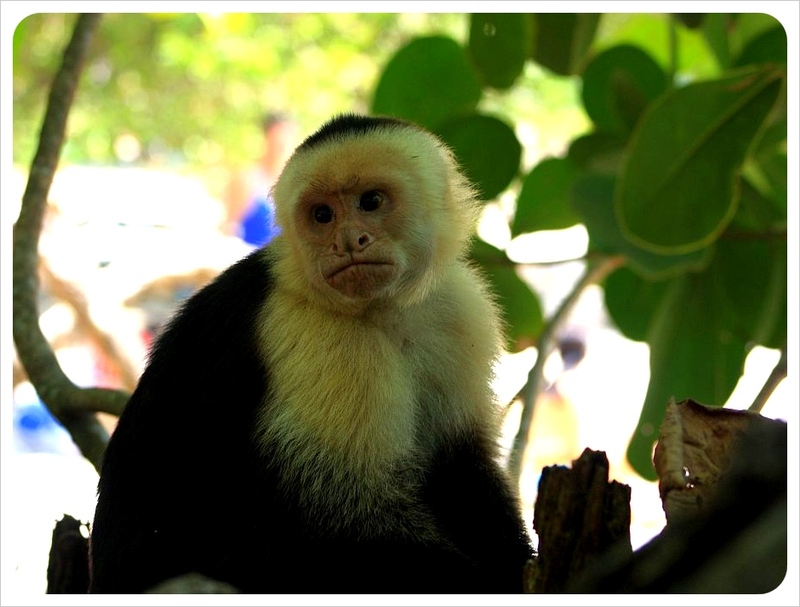 His argument was convincing and we’re fairly certain that Casa Valeria will over Wi-Fi sooner rather than later. 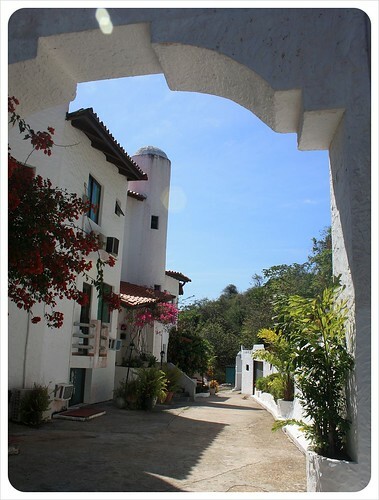 Casa Valeria is one of the best budget beachside hotels that we have seen so far. 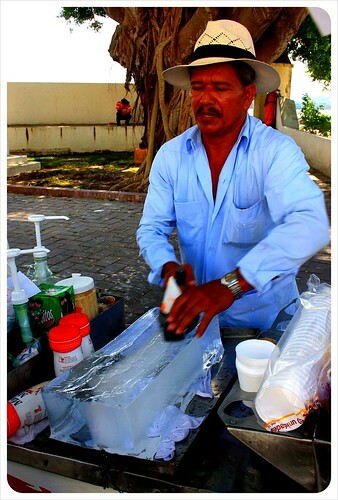 The owners are a very friendly family who keep the hotel and the yard spotless. The extras (free coffee, clothes lines, beach showers) are the icing on the cake. Casa Valeria embodies one of those strange travel conundrums, where budget hotels at times offer much better free and guest friendly services than their luxury counterparts up the road. 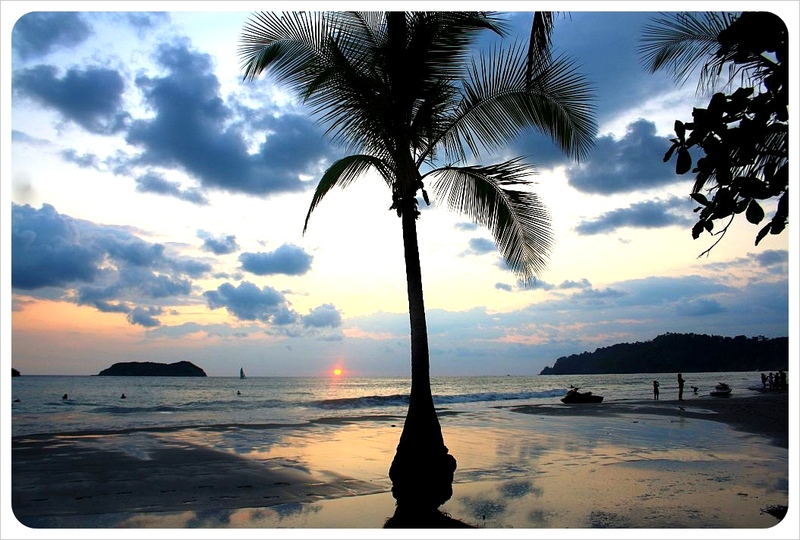 It is a place where you can truly forget and ‘log off’ for a week or two – right at the beach and at the same time close enough to all the delicious restaurants, juice bars, nightlife and a small, but quality supermarket to gather ingredients for some cheap and easy cooking. LGBT Friendly: As far as we could tell, yes. Not directly discussed. 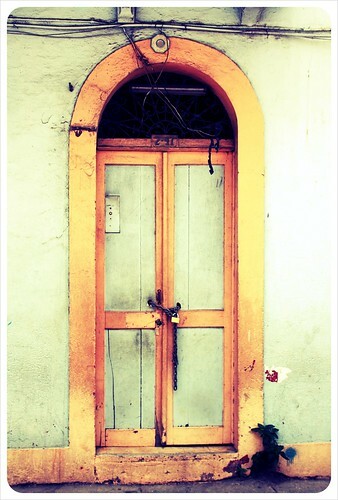 Website: No website, but listed with phone number here.